The entire life of the first incarnation of King Crimson squeezes into the last year of the 1960s. The band first rehearsed on 13th January 1969, released their seminal album "In The Court of the Crimson King" on 10th October and played their final concert at Fillmore West, Los Angeles on 16th December. 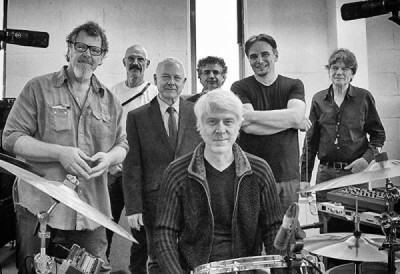 In 2014, King Crimson returns to live performance with a seven-piece lineup and a different repertoire, drawn from the history of the band, reimagined for three drummers. Mel Collins returns to the band and Jakko Jakszyk fills the role of vocalist guitarist. Tony Levin´s most notable bass playing albums and tours have been with: Peter Gabriel, King Crimson, John Lennon, Pink Floyd and collaborative groups: Bruford Levin Upper Extremities, Bozzio Levin Stevens, Liquid Tension Experiment, Levin Torn White, Levin Minneman Rudess, Levin Brothers. Born in Boston, June 6, 1946, Levin grew up in the suburb of Brookline, starting playing upright bass at 10 years old. In high school he picked up tuba, soloing with the concert band, and started a barbershop quartet. But he primarily played Classical music, attending Eastman School of Music in Rochester, NY, where he had the chance to play under Igor Stravinsky and in the Rochester Philharmonic. In 2018, Tony Levin continues to tour with King Crimson and shares his thoughts with the readers of melodic.net about the Chapman Stick, the music of KC and the challenge to play 3-hour concerts at his age. Hello Tony, it´s been a while since King Crimson´s latest studio album, there have been plenty of live releases from the band making your fans quite busy collecting them all, but will we ever see a new studio album from you guys? Tony Levin-I can never say for sure what's going to happen with Crimson -- the band is always surprising me. But there are no plans for a studio album and I think it's not too likely we'll do one in the next year. We really like the new way we've fallen into of touring a lot, rehearsing between tours, and adding new material and 'classic' material each tour. Then when a particular show strikes us as very special, we can release that recording because we record them all at high quality. I can´t think of that many famous musicians that plays the Chapman Stick, more than Nick Beggs, Alphonso Johnson, Trey Gunn and a few others. How come this instrument hasn´t become more popular, is it too difficult to learn how to play on? Do you still practice several hours per day or do you think it´s enough with the time you rehearse with the band? Tony Levin-That varies a lot. Right now I'm home for the month of May and practicing a lot each day because we've added some material with difficult parts for me. We have a few more days rehearsal before the first shows in June, and by then I'll need to be up to speed on the parts. So it's still a challenge being in the band - as much as when I joined, back in 1981. What KC song or which songs are the hardest ones to play live, technically speaking? Tony Levin-Generally what makes things hard in the concerts is just the overall concentration and focus needed. There are lots of minute things to remember, lots of pedal changes that must be right, and with a 3 hour concert, there are a hundred 'pitfalls' if you're tired or just having a bad day. Having said that, for me, the piece ConstruKCtion of Light is the most likely to give me problems… it's a nonstop busy bass line, that the rest of the band depends on to hear where their parts fall, and if I screw it up (yes, I have!) then everything could fall apart. You are turning 72 this summer, how do you keep in such great shape at your age so you manage to play 3-hour concerts every night? Tony Levin-Well, first of all, thank you for the compliment. Really the show is not physically challenging, just mentally, as I've mentioned. Holding up on the road does get more difficult as you age, though. Mostly it's when a virus goes through the band and crew that it gets tough to work through it and recover quickly. I'm not especially good at that, but I try to be in good shape when I arrive for the tour so I can hopefully weather things that might come our way. If you look back on your CV with all the talented musicians you played with from members of Dream Theater to Yes and Peter Gabriel to KC. Would you say Robert Fripp is the most demanding one where you can look forward to a payroll deduction if you don´t get every note right each night? Tony Levin-I wouldn't say that. The band itself, King Crimson, is demanding, in that the musicianship must be high, and we need to keep pushing ourselves to progress as players, not only as a band. I went to see KC in concert on October 1st, 2016 in Stockholm and thought the show was great but I missed songs from the 80´s albums Discipline and Beat in the set. Will you include any songs from that era on the upcoming tour? Tony Levin-I can't say for sure what pieces we'll do on the tour -- and each night's setlist is different, so no guarantees about a particular show. But in the last tour we did, there was "Discipline", "Indiscipline" and "Neurotica". It's an interesting element for me to re-approach my old bass lines and continue the adventure I started in the 80's about refining and improving them - but now with 3 drummers. What I appreciated before the show, was the announcement that no recording or photos were allowed during the concert. We should record with our ears and take pictures with our eyes instead. I think people watching the shows through their smartphones has become quite a problem lately. From what I heard, Kate Bush and A Perfect Circle also have a "no cell phone" policy. Have your fans respected this or did you have to kick out anybody from a venue? Tony Levin-We do have security keep an eye on things… alas, you can't trust all of the audience to behave. But most people, like you, appreciate that now they can watch the show, not be distracted by a cellphone in front of them. When you are out on tour, do you have any time off to actually visit the cities you play shows in, or is it just hotelrooms and airports that you have time for? That varies from tour to tour. Usually not much. But with Crimson nowadays, if we have multiple shows in a city, you're finally there with a morning and early afternoon off. Very special, and some cities I've been to a dozen times without having any free time before. Finally, I think of you as a complete bassplayer where you can master any kind of technique on the bass. But is there any style you can improve when it comes to using a pick, playing with fingers, slapping or two-handed tapping? Tony Levin-I am always trying to improve my techinque on all kinds of bass and Stick playing. And there are plenty of genres I'm not very good at. But happy to keep learning, keep trying to become the best player I can.